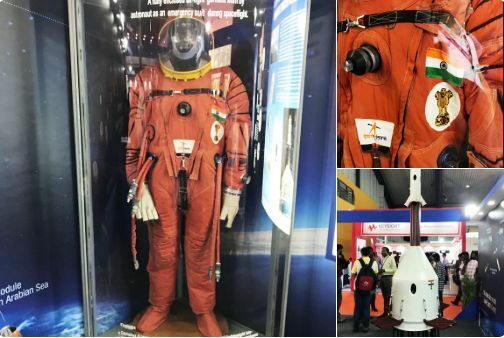 The orange-coloured prototype space suit was developed by the ISRO over the past two years at Vikram Sarabhai Space Centre in Thiruvananthapuram. The suit can hold one oxygen cylinder, allowing an astronaut to breathe in space for 60 minutes. The Gaganyaan mission was announced by Prime Minister Narendra Modi during his 72nd Independence Day speech. PM Modi announced that this manned space mission will take Indian astronauts to space on board 'Gaganyaan' by 2022. • The orange-coloured prototype space suit was developed by the ISRO over the past two years at Vikram Sarabhai Space Centre in Thiruvananthapuram. • The suit can hold one oxygen cylinder, allowing an astronaut to breathe in space for 60 minutes. • ISRO has developed two suits and will create one more suit as three astronauts will be part of mission to send Indians into space on an Indian spacecraft by 2022. • ISRO also displayed the crew model and the crew escape model. A prototype crew model has already been tested by the ISRO. • In the crew model capsule, the three astronauts will be living for five to seven days in a 400 km orbit from the Earth's surface. • The capsule will have a thermal shield and it will turn into a ball of flame, travelling towards the Earth when they re-enter the atmosphere. • The shield will ensure that the temperature inside the capsule is 25 degrees, but the astronauts can see the flames just through the window. • The capsule is expected to rotate around the Earth every 1.5 hour or every 90 minutes and astronauts will be able to witness sunrise and sunset. • The astronauts can see India from space twice every 24 hours. They will conduct experiments on microgravity. • The capsule containing three astronauts will take 16 minutes from take-off to reach the desired orbit 400 km from Earth, and while returning will take 36 minutes to reach Earth. • The capsule is expected to land in the Arabian Sea, just off the coast of Gujarat where Indian Navy and Coast Guards will be on standby.